It was nice to be able to offer customers something different. It’s the first Wake Up To Organic we’ve ever taken part in, and we just wanted to give it a go. We were very interested to see what kind of reception we’d get from our customers, as we’d never really done anything like it before, being a small shop in a small town. We’re also hugely passionate about organic produce, too, as we pack and sell a lot of our own organic products. We found that we love putting out samples for our customers just as much as they love trying them! We’ve been setting out samples pretty much every day since the event, so it definitely stuck with us. It was nice to be able to offer the customers something different to try, and chat about the event and the ethos behind organic produce. Also, just seeing the customers enjoying the food and the chatty atmosphere was enough for us to really feel like we’d pulled it off! We kept it quite simple on the day, as we don’t have a huge amount of counter space to work with in the shop. 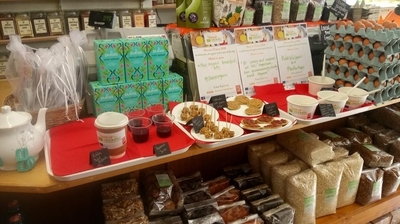 We cleared off our usual stock on the front counter, turned it into a mini buffet station, and we made great use of the fantastic products donated by the suppliers for the event. 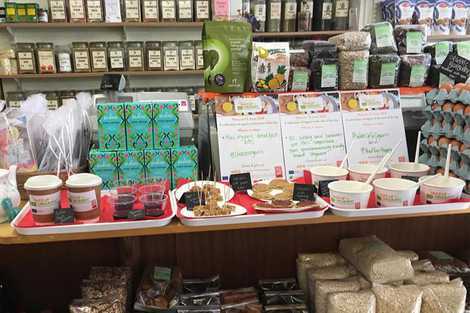 We mixed up muesli and seed pots with organic yoghurt – both dairy, and dairy-free yoghurt, so there was something for everyone. We also prepared oatcakes with raspberry jam and peanut butter, along with the Dove’s Farm flapjacks, which we cut up into bite-sized pieces. These were a big success with any children that came in! This was all washed down with a lovely cup of Pukka tea from our giant teapot. Customers were also treated to a lovely gift bag full of samples from Pravera, kindly donated for the event. Yes, absolutely! We weren't sure how it would go, as Wednesday probably isn’t our busiest day of the week, footfall wise. All of the samples went down well, though, and customers seemed to really enjoy experiencing something a bit different on an average morning. We enjoyed ourselves, too, so that obviously means it was a success! 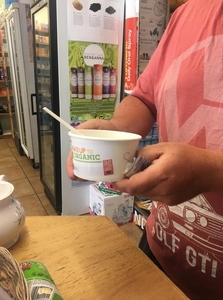 Probably when we made a gentleman’s day by revealing that some of the muesli pots were made with organic vegan yoghurt so he could have one too. Better still, he hadn’t had any breakfast yet, so he was chuffed with the offerings. Mainly through Facebook, Instagram, and word-of-mouth with our regular customers. We also passed out flyers to most customers on the day, too. For one, we’d definitely like to advertise the event a lot more beforehand. It’s always a tiny bit daunting not knowing exactly how well a new event will go down with your clientele, but now we know it was a success, we’ll be a lot more confident in advertising it next year. We’d like to make the breakfast spread bigger and better as well, and see if we’d be able to get a table set up outside. We’d love to give it a go again next year, and see if we can get more of the town involved as well.